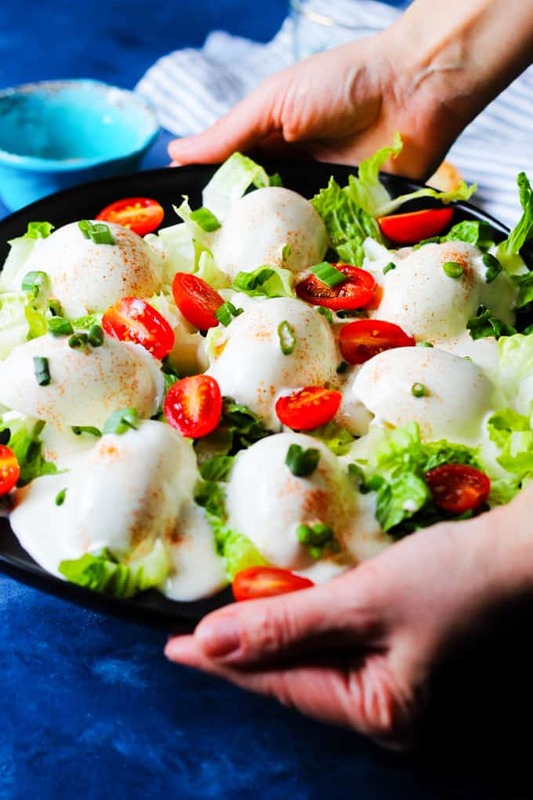 Eggs Mayonnaise (‘Jajka w Majonezie’) is a traditional Polish appetizer. You can find it in every home around the Holidays, especially Easter. It’s super simple to make, requires only a few ingredients, and it tastes absolutely delicious! If you’re a reader of my blog, then you already know that I was born and raised in Poland. In Polish Cuisine there are a handful of dishes that constantly resurface in every house around the holidays, or for any large gathering. This is the case with the Russian Salad, that is called in ‘Salatka Jarzynowa,’ and with these Eggs Mayonnaise. 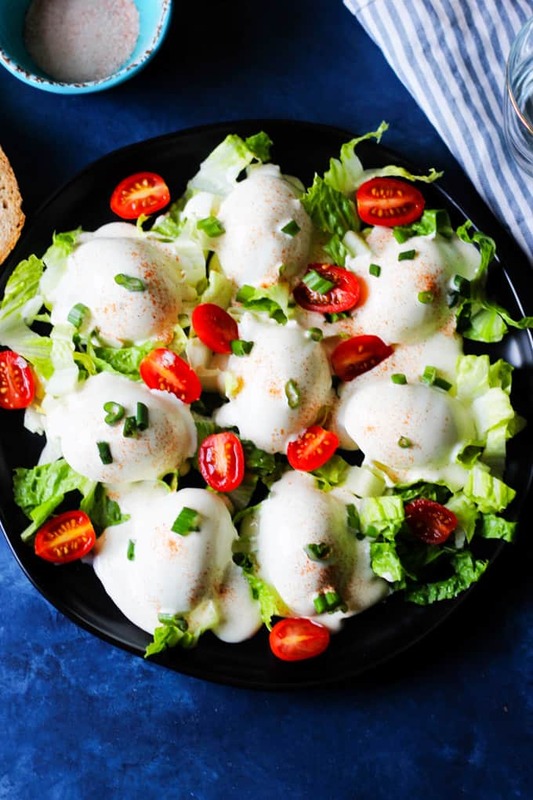 I’m not exaggerating when I say that you’ll find Eggs Mayonnaise at every holiday, gatherings, birthday parties, etc… The point being, that’s how popular they are. Their fanfare can be compared to Deviled Eggs in the U.S., circa 1980’s (I realize their popularity is waning). 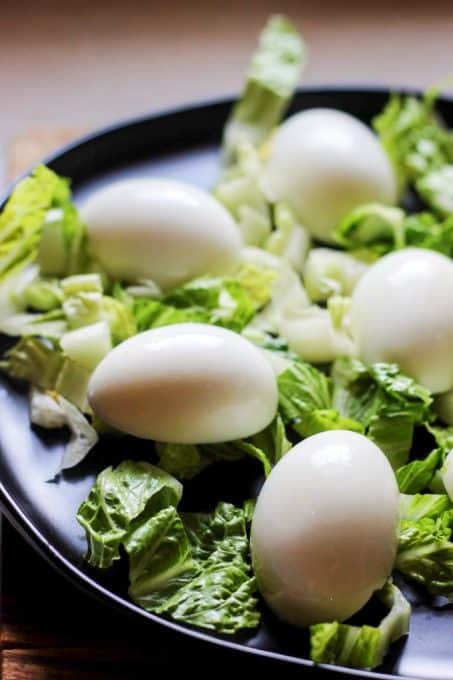 With Easter now approaching, I figured that introducing you to this delicious Polish egg appetizer was timely. Personally, I make them every year for Easter and my American family is totally in love with them. If you like egg salad you’ll love my Eggs Mayonnaise. What Ingredients Are Needed to Make Eggs Mayonnaise (Jajka w Majonezie)? Mayonnaise (with a splash of water). Oh, I almost forgot that I sprinkle a little sweet paprika on top for some color and extra flavor too. How to Make Eggs Mayonnaise? 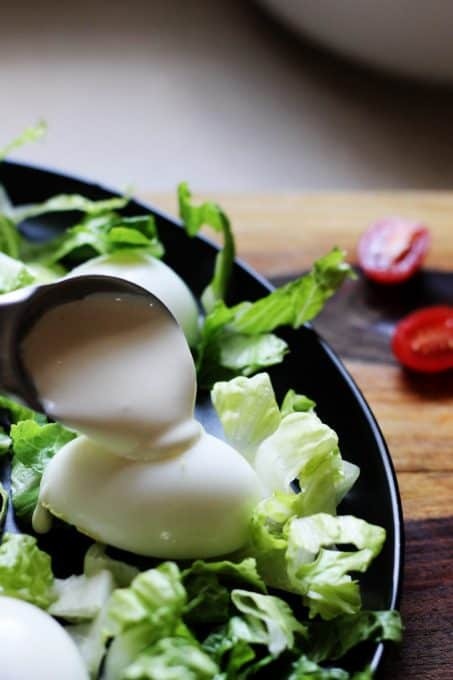 The steps to make Eggs Mayonnaise are very simple. 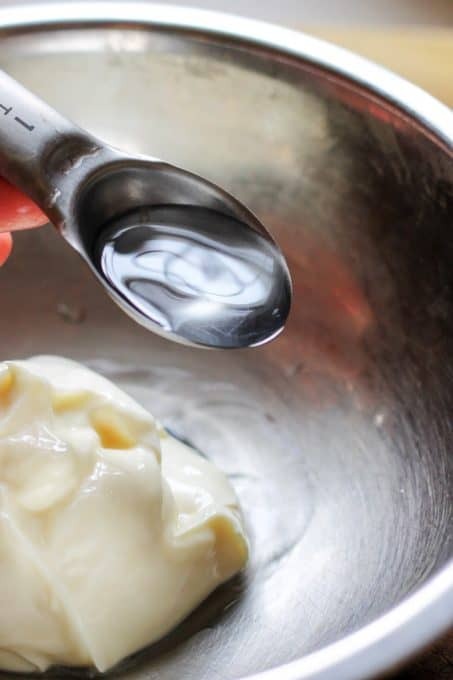 Step 1: Prepare your Mayonnaise – mix together a 1/2 cup of Mayonnaise with 2 tablespoons of room temperature water to achieve a nice silky sauce. 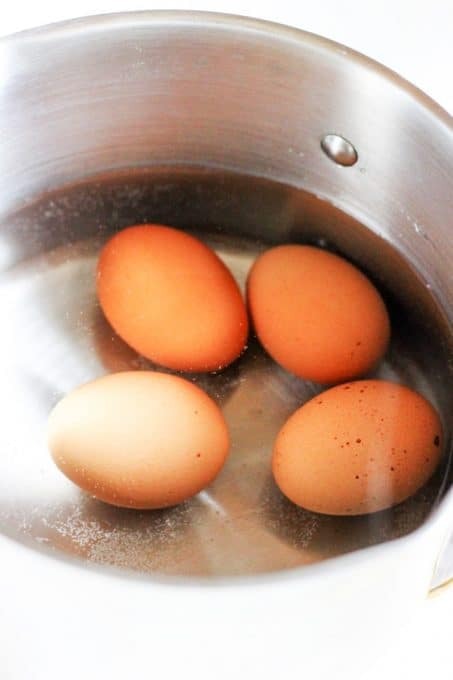 Step 2: Prepare your Eggs – Place 4 eggs into a pot of cold water. Bring it to a boil. 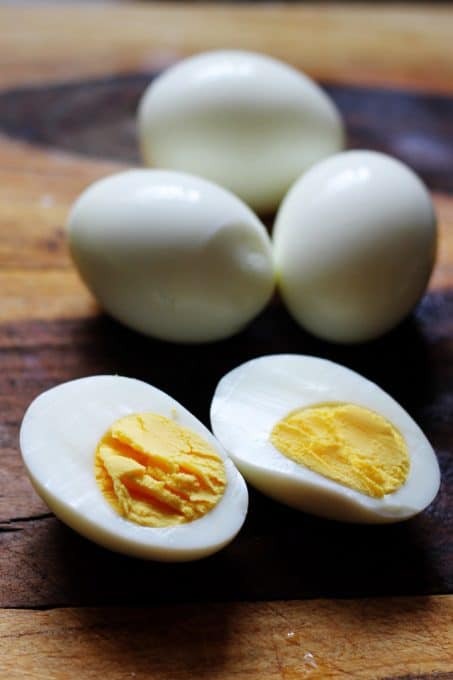 Lower the heat to low and boil the eggs for 10 minutes. Then place the eggs in cold water to cool them off completely. Peel and cut your eggs in half, lengthwise. Step 3: Assemble the dish – If using lettuce, spread it at the bottom of your serving plate. Place the egg halves flat side down and spoon over a tablespoon of mayonnaise sauce on top of each egg half. Garnish with tomatoes and scallions, or the other garnishes of your choice. What to Serve Eggs Mayonnaise with? I make this Cabbage and Kielbasa from new cabbage every time it’s in season during summer months, as well as this Polish Cucumber Salad called Mizeria. 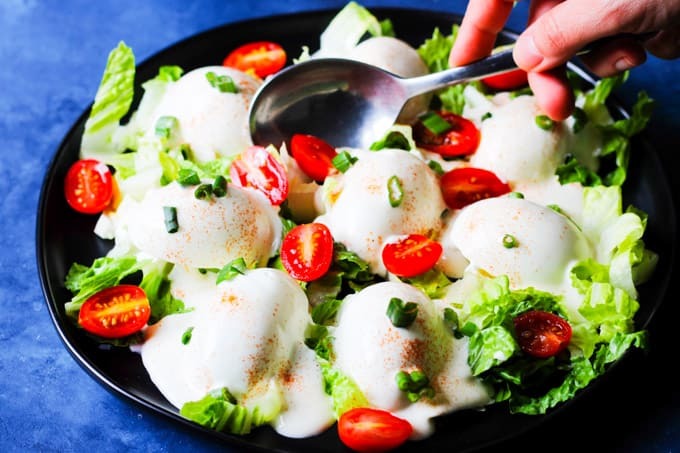 Anyways, try my Eggs Mayonnaise this coming Easter and let me know in comments below how you liked them. 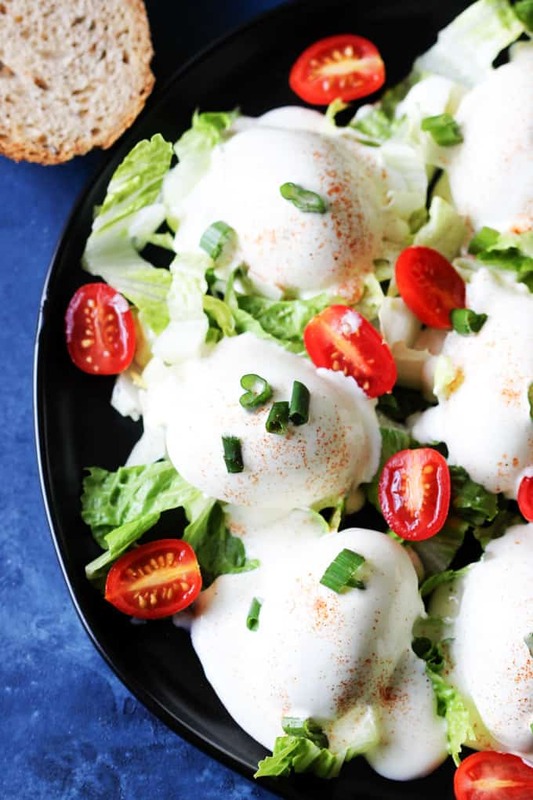 Eggs Mayonnaise ('Jajka w Majonezie') is a traditional Polish appetizer. You can find it in every home around the Holidays, especially Easter. It's super simple to make, requires only a few ingredients, and it tastes absolutely delicious! 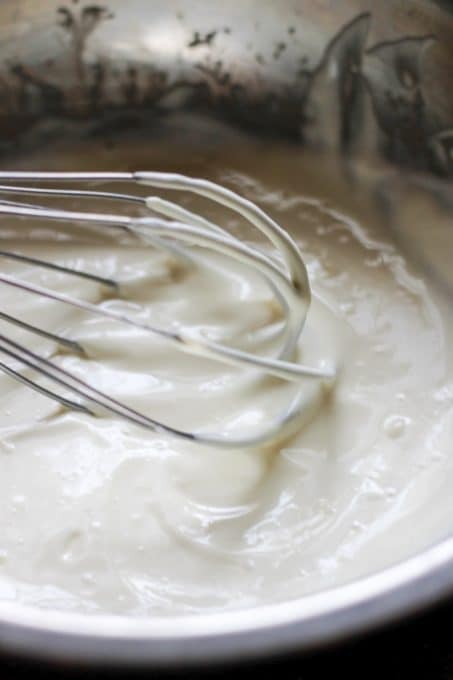 Prepare your Mayonnaise: mix together a 1/2 cup of Mayonnaise with 2 tablespoons of room temperature water to achieve a nice silky sauce. Prepare your Eggs: Place 4 eggs into a pot of cold water. Bring it to a boil. Lower the heat to low and boil the eggs for 10 minutes. Then place the eggs in cold water to cool them off completely. Peel and cut your eggs in half, lengthwise. Assemble the dish: If using lettuce, spread it at the bottom of your serving plate. Place the egg halves flat side down and spoon over a tablespoon of mayonnaise sauce on top of each egg half. Garnish with tomatoes and scallions, or the other garnishes of your choice. What a beautiful dish! 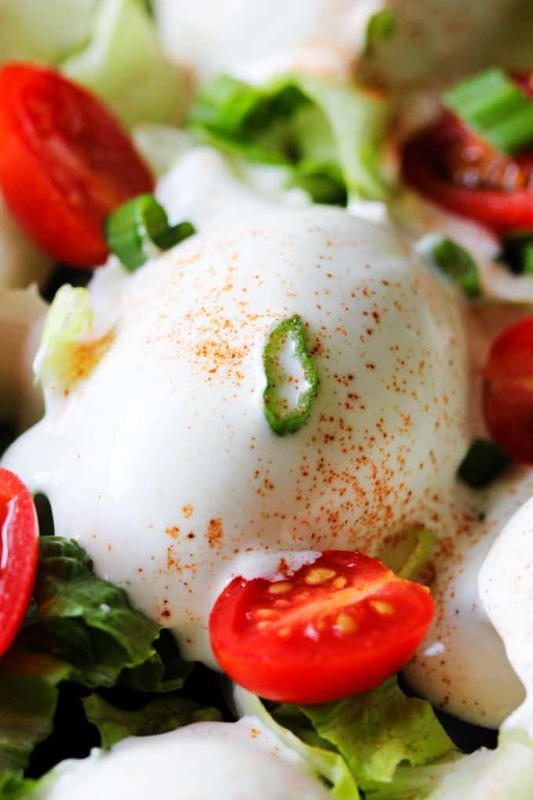 I adore deviled eggs, but I’ve never had or seen this idea. The presentation is lovely! WOW! I have never heard of this appetizer but I LOVE Polish food – savory and sweet! So comforting! 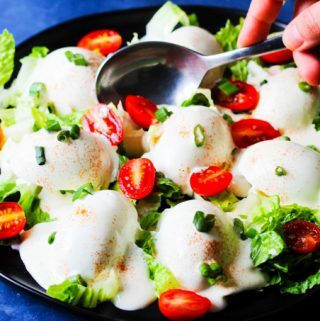 I like that this is a healthy low carb appetizer that I can make when I have my keto-friends over for dinner! Oh yeah! It’s perfect for anyone who is on a Keto diet. That looks like such a delicious appetizer! Perfect for the holidays! I know my family will gobble it up! Thanks Beth. I hope your family would like it. Oh yum- this looks delicious! And sort of like a deconstructed deviled egg 🙂 So good!